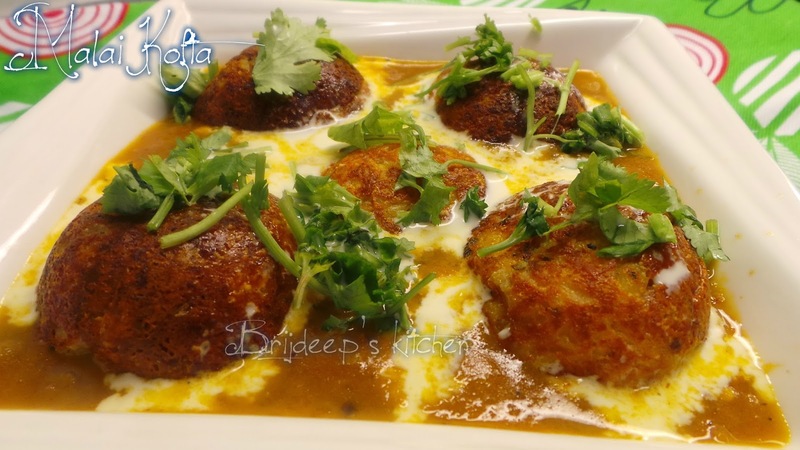 Malai Kofta is a classic North Indian dish originated from the Mughlai cuisine. 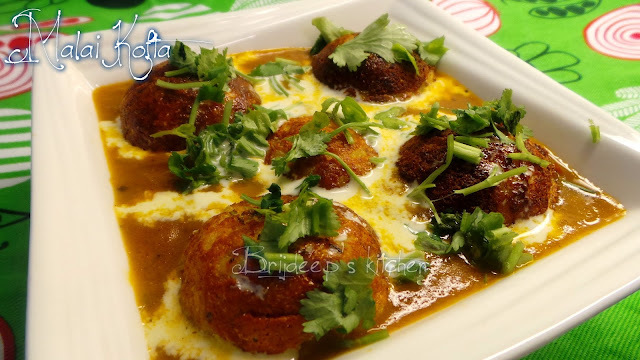 Basically the dish consists of fried dumplings, the "koftas"; which are served dipped in a wonderful aromatic tomato curry with wonderful Indian spices, and topped with fresh cream, i.e. 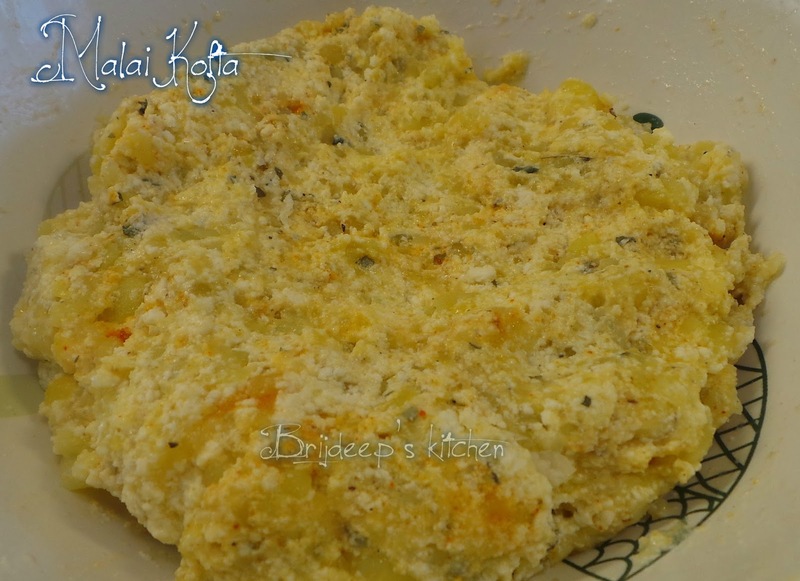 "malai". 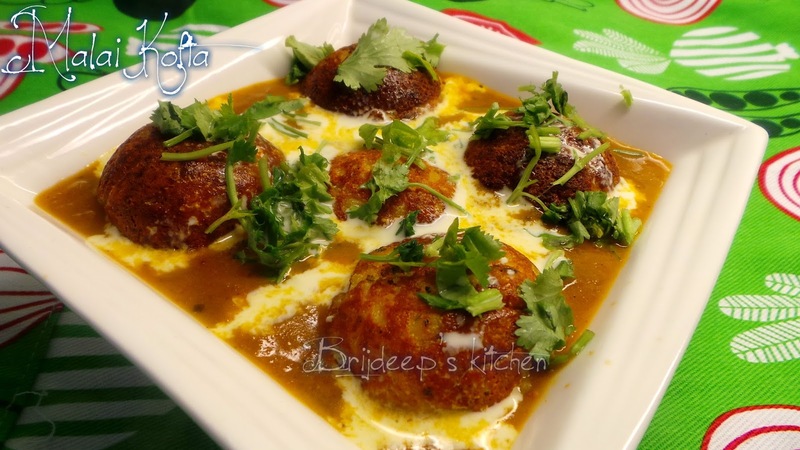 This makes a wonderful main course meal as the fried dumplings in the curry make a heavy meal. 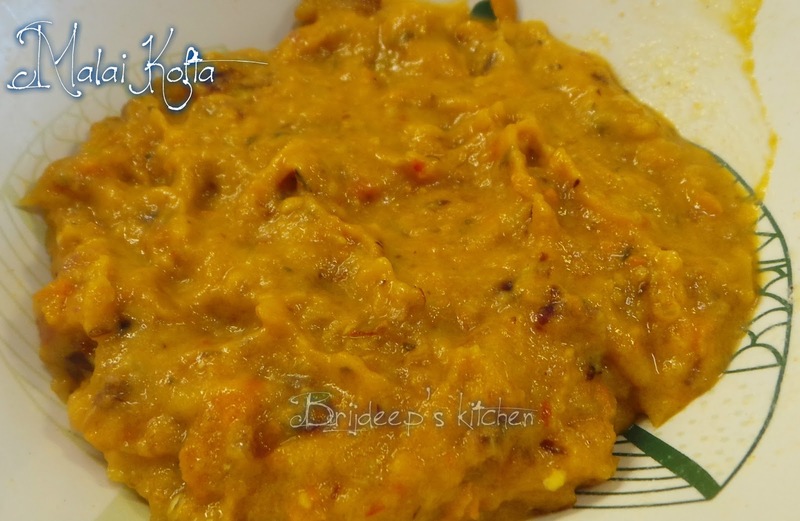 It goes well with roti/paratha/naan and even rice. 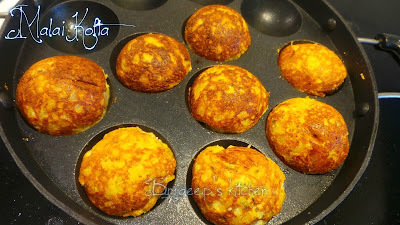 In the recipe, I have used fresh home made cheese + boiled potatoes for the dumplings. I have made the koftas in appe pan which is a healthier option as it requires just a bit of oil and tastes absolutely perfect. 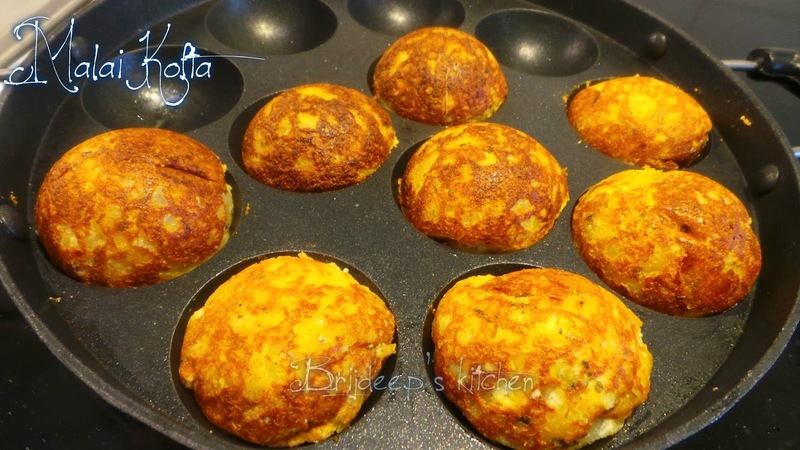 I have tried this by frying many times but have updated the post with the appe pan method. Firstly we prepare koftas. 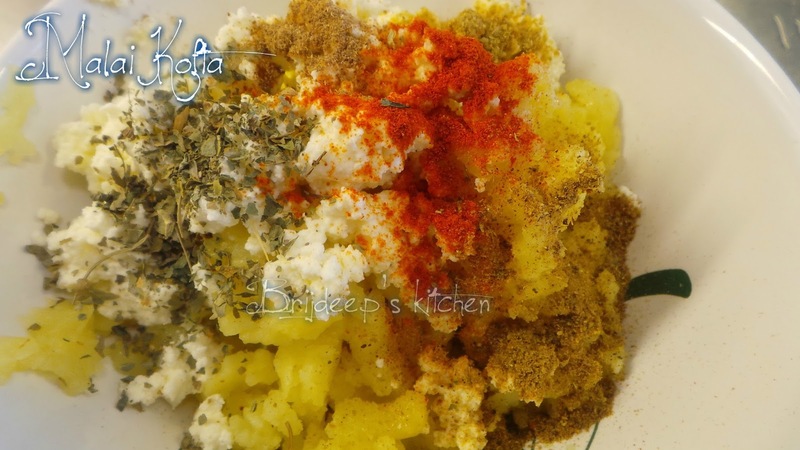 Add the boiled potatoes and the paneer together in a bowl. 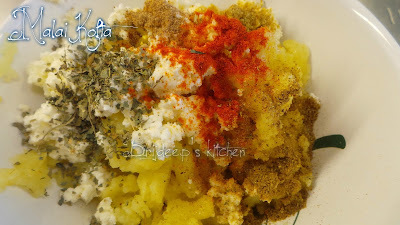 Add the spices: salt, red chilli powder, mango powder, garam masala and kasoori methi. Mix everything well to make a uniform dough. Grease your palms and pinch a small portion from the dough. 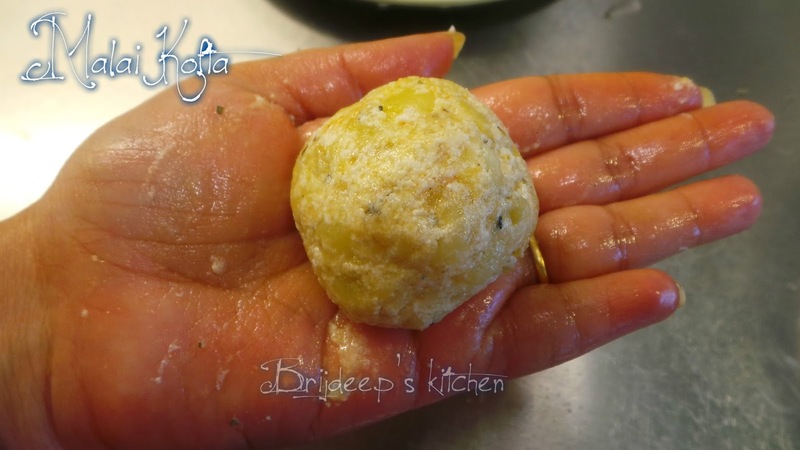 Roll it smoothly between your palms so there are no cracks in the ball. 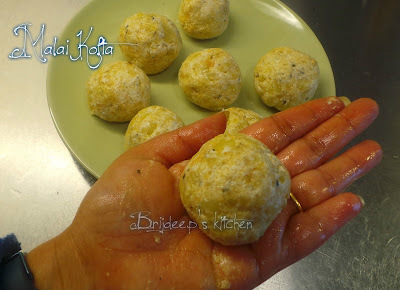 Prepare balls from all the dough and keep aside. Heat the appe pan on medium-low flame and add a drop of oil in each cavity. Place all the balls in the cavities of appe pan. Let cook for about 10-12 minutes. Do not cover. Flip the koftas carefully to the other side and similarly let cook for another 10-12 minutes. Remove from the flame and keep aside. I use a tablespoon to scoop out the balls carefully from the pan so they don't break. They usually tend to break or disfigure if try to remove with help of wooden spatula provided with the appe pan. 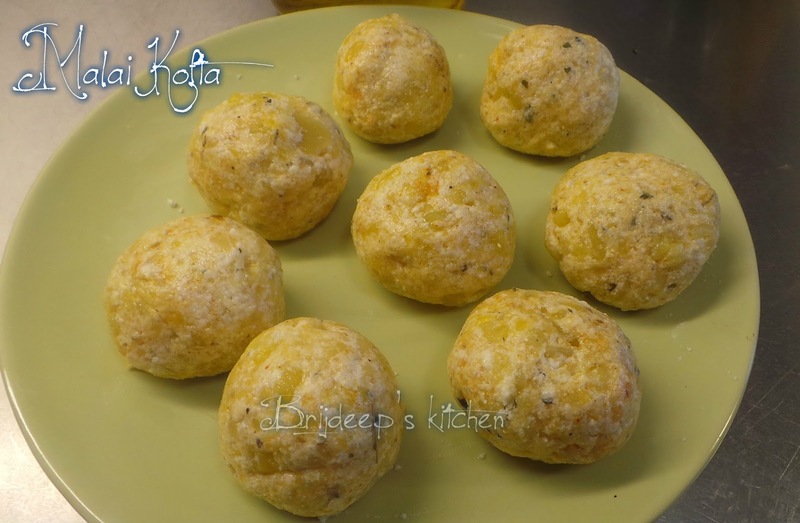 These balls can also be deep fried if you don't have an appe pan. Now we prepare the curry. Heat oil and crackle the cumin seeds. Add the bay leaf and cloves. Add the chopped onions and fry until they turn transparent. Add the chopped ginger and garlic and fry for about 2 minutes. Add the tomatoes and green chilli. Sprinkle salt and cover. 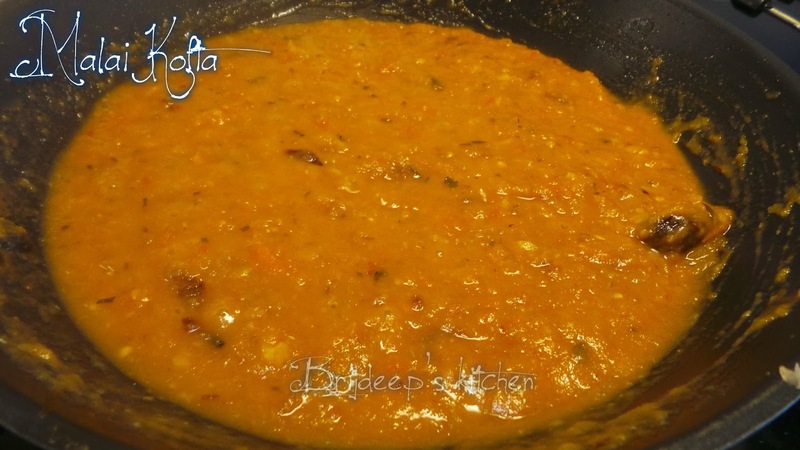 Let cook until the tomatoes are soft and mushy. 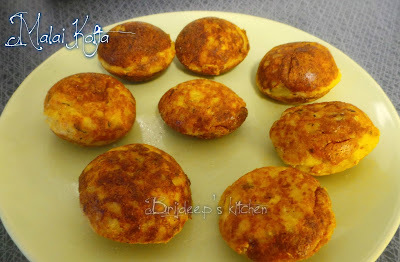 Remove cover and add red chilli powder and coriander powder. Mix well and turn off the flame after a minute. Let this masala cool completely and then grind to a fine paste in the mixer. Now heat the same pan again. 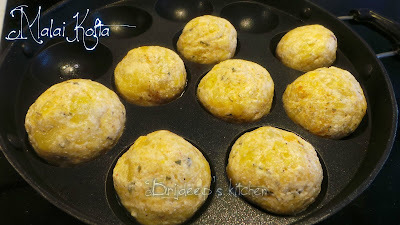 You won't need to add more oil if using a non stick pan otherwise add a little oil. 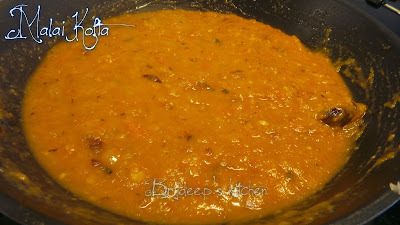 Add the black cardamom and the ground masala paste. Mix well and sprinkle a little water. Mix again. Again sprinkle little water and mix. Let cook for about 30 seconds. Repeat this 5-6 times, this will make the curry creamy without making it watery. Do not add water at once. Now the curry consistency will be perfect. Add the yogurt and mix well. Let come to a boil and then add the garam masala. 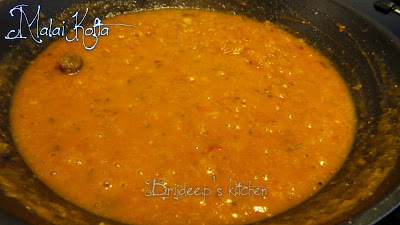 Mix well and turn off the flame when it reaches desired consistency. 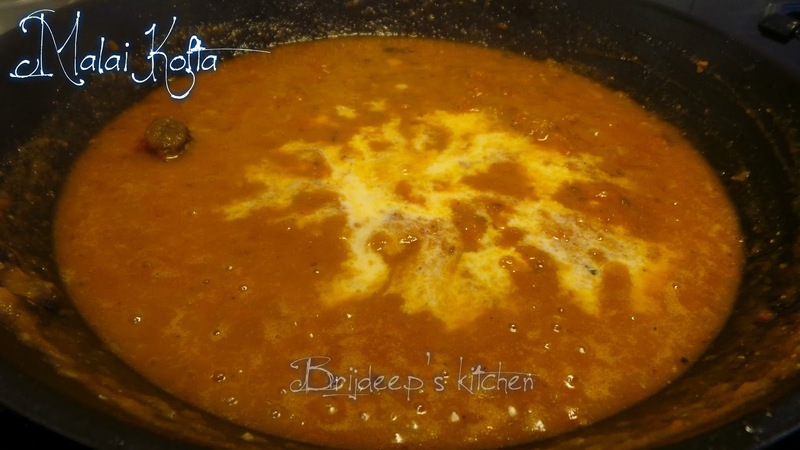 Generally the curry is creamy thick and not watery so the adding little water in stages will help to make it creamy. 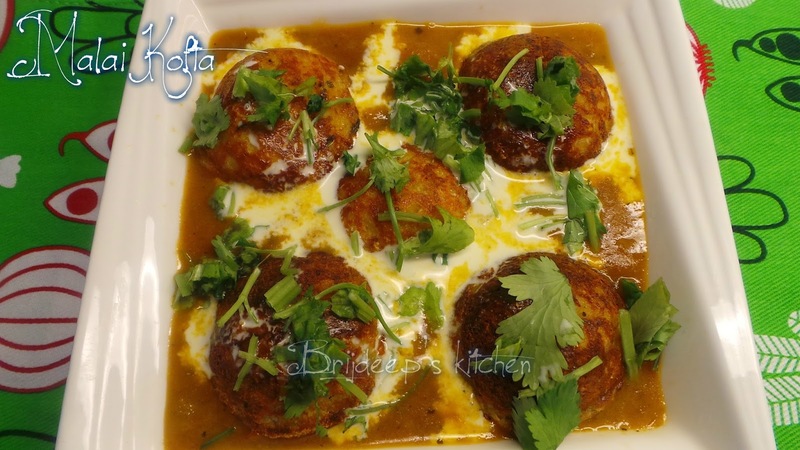 Add the koftas to the curry and garnish with fresh cream and freshly chopped coriander leaves. Serve immediately. Don't add the koftas to the curry if not serving right away as it will make the koftas soggy and they will break. 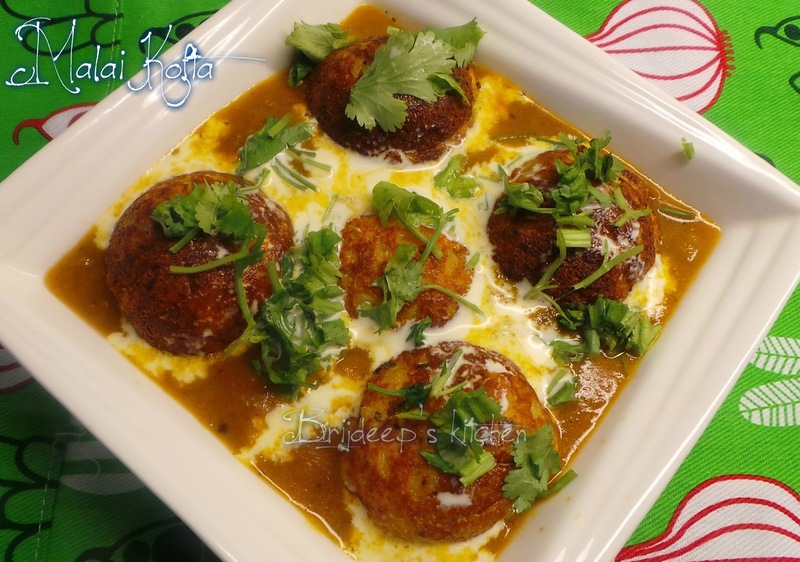 If serving later, warm the curry and koftas separately and serve hot. You can even prepare and refrigerate the koftas a day before to add to the curry. Loved this recipe? Please share this post and leave your valuable comments/feedback in the comments section below. Don't forget to connect with me on Facebook for regular yummy updates.